"This is a favorite supper dish that's quick and easy to make. I double it for our family of 4 growing boys. We serve it all up and then add on the goodies that are left in the bottom of the bowl - there's always bacon and eggs left down there." Meanwhile, place bacon in a large, deep skillet. Cook over medium high heat until evenly brown. Drain, reserving some of the drippings, crumble and set aside. Scramble eggs in bacon drippings. Place spaghetti in a large bowl. Pour in olive oil, and mix well; use enough to just moisten spaghetti. 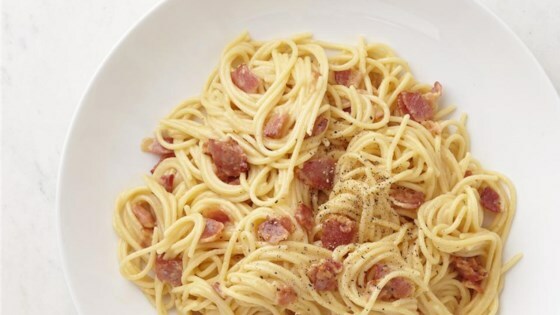 Stir in bacon, eggs, and Parmesan cheese. Serve immediately. That is a huge amount of bacon for six servings, I'd cut it in half. Also, the eggs are tossed with the hot pasta to cook, not scrambled into little lumps. My family loved this recipe. I used 6 eggs and thin spaghetti. I also broke my spaghetti into smaller pieces for cooking. Yum - I love this stuff! I add a bit of garlic to mine too, as it seems to need something extra. Delicious! It was a huge hit!